Patient presented with advanced wear, erosion and decay of nearly his entire dentition. His upper and lower teeth did not meet properly and he had difficulty chewing. 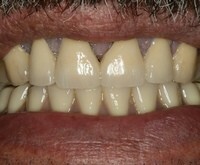 Case was treated with a lower overdenture and upper tooth-colored crowns. Proper function was restored and esthetics improved. This patient presented with both esthetic and functional concerns. He wished to correct alignment problems, spacing, and worn appearance of his front teeth. He also wished to correct bite and alignment issues caused by retained primary (baby) teeth. The case was treated with orthodontic treatment (braces), primary tooth removal/implant placement, and porcelain veneers. Patient presented with rampant decay and severe gingival inflammation. Case was treated with endodontic therapy, periodontal (gum) treatments and porcelain crowns. 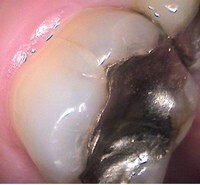 Patient was dissatisfied with dark margins around her old crowns. 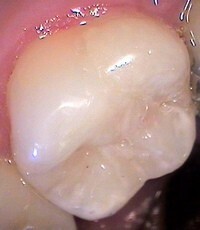 Case was treated with new crowns using updated materials. Unsightly silver fillings and fractured teeth can be restored with custom porcelain restorations that are virtually indistinguishable from natural teeth.